Descend into the core of the criminally insane as The Joker launches his most diabolical plot ever. The inmates of Arkham Asylum have been set free - and it’s up to Batman, to bring order to the chaos and take back the asylum. Explore the depths of this never-before-seen island as you experience the darkest journey of Batman’s life. Written by Paul Dini and featuring the voice talents of Mark Hamill and Kevin Conroy. • PLAY AS THE JOKER - Challenge Maps available only on the PLAYSTATION 3 computer entertainment system. • Control Gotham City’s most notorious lunatics, including The Joker, Harley Quinn, Bane, Poison Ivy, and Killer Croc. • Utilize Batman’s detective skills and cutting-edge forensic tech to gather evidence and clues. • Unleash brutal combos with the innovative FreeFlow combat system. 04-06-2017 silverbow Box Text WELCOME TO THE MADHOUSE Descend into the core of the criminally insane as The Joker launches his most diabolical plot ever. 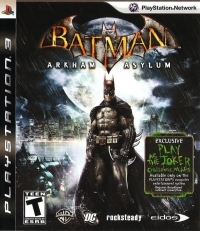 The inmates of Arkham Asylum have been set free - and it’s up to Batman, to bring order to the chaos and take back the asylum. Explore the depths of this never-before-seen island as you experience the darkest journey of Batman’s life. Written by Paul Dini and featuring the voice talents of Mark Hamill and Kevin Conroy. 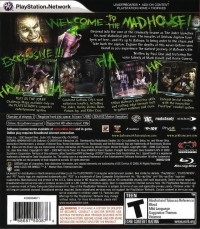 • PLAY AS THE JOKER - Challenge Maps available only on the PLAYSTATION 3 computer entertainment system. • Control Gotham City’s most notorious lunatics, including The Joker, Harley Quinn, Bane, Poison Ivy, and Killer Croc. • Utilize Batman’s detective skills and cutting-edge forensic tech to gather evidence and clues. • Unleash brutal combos with the innovative FreeFlow combat system. 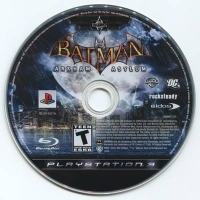 This is a list of VGCollect users who have Batman: Arkham Asylum in their Collection. This is a list of VGCollect users who have Batman: Arkham Asylum in their Sell List. This is a list of VGCollect users who have Batman: Arkham Asylum in their Wish List.